CAE recently supported both the Royal Canadian Air Force (RCAF) and Royal Australian Air Force (RAAF) as they participated in Coalition Virtual Flag 16 (CVF16), one of the world’s largest virtual air combat exercises. Hosted by the United States Air Force, CVF16 took place in mid-August so that simulated aircraft could participate in the joint, multi-national air combat training exercise. Aircrews from the United States, United Kingdom, Australia, and Canada participated. 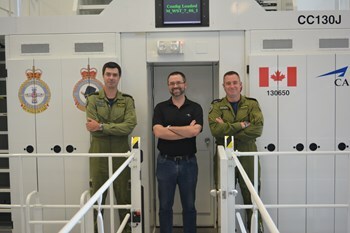 CAE assisted the RCAF’s 426 Squadron at 8 Wing Trenton and the Canadian Forces Air Warfare Centre (CFAWC) in the preparation, planning and execution of the RCAF’s participation in CVF16. The RCAF’s 426 Squadron flew a CAE-built CC-130J full-mission simulator as part of the exercise where the RCAF had responsibility for performing a range of airland and airdrop missions, including the insertion of Special Operations Forces (SOF) assets. CAE’s computer-generated forces software provided added realism by generating numerous enemy virtual threats, such as SU-27 fighters and ground-based surface-to-air missiles, as well as a range of friendly forces. In total, CAE’s simulation software provided more than 2,000 computer-generated constructive and virtual entities in the synthetic environment. The RAAF’s CAE-built C-130J full-flight mission simulator (FFMS) along with a C-130J tactical airlift crew trainer (TACT), both located at RAAF Base Richmond in New South Wales, took part in CVF16. CAE supported the integration, networking and testing of the FFMS and TACT into the Coalition Virtual Flag exercise.